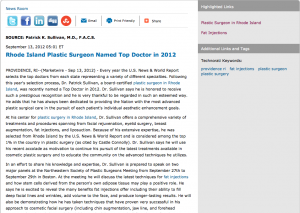 Rhode Island Plastic Surgeon Named Top Doctor in 2012 - Patrick Sullivan, M.D. Providence, RI — Every year the U.S. News & World Report selects the top doctors from each state representing a variety of different specialties. Following this year’s selection process, Dr. Patrick Sullivan, a board-certified plastic surgeon in Rhode Island, was recently named a Top Doctor in 2012. Dr. Sullivan says he is honored to receive such a prestigious recognition and he is very thankful to be regarded in such an esteemed way. He adds that he has always been dedicated to providing the Nation with the most advanced plastic surgical care in the pursuit of each patient’s individual aesthetic enhancement goals. At his center for plastic surgery in Rhode Island, Dr. Sullivan offers a comprehensive variety of treatments and procedures spanning from facial rejuvenation, eyelid surgery, breast augmentation, fat injections, and liposuction. Because of his extensive expertise, he was selected from Rhode Island by the U.S. News & World Report and is considered among the top 1% in the country in plastic surgery (as cited by Castle Connolly). Dr. Sullivan says he will use his recent accolade as motivation to continue his pursuit of the latest treatments available in cosmetic plastic surgery and to educate the community on the advanced techniques he utilizes. In an effort to share his knowledge and expertise, Dr. Sullivan is prepared to speak on two major panels at the Northeastern Society of Plastic Surgeons Meeting from September 27th to September 29th in Boston. At the meeting he will discuss the latest techniques for fat injections and how stem cells derived from the person’s own adipose tissue may play a positive role. He says he is excited to reveal the many benefits fat injections offer including their ability to fill deep facial lines and wrinkles, add volume to the face, and produce longer-lasting results. He will also be demonstrating how he has taken techniques that have proven very successful in his approach to cosmetic facial surgery (including chin augmentation, jaw line, and forehead contouring) and used them to help children and adolescents with cleft and craniofacial abnormalities. Dr. Sullivan says that attending or lecturing at meetings such as the Northeastern Meeting enables him to hone his skills and remain at the forefront of his field so as to consistently represent his Top Doctor nomination. After earning his medical degree from the Mayo Medical School in Minnesota, Dr. Patrick Sullivan completed his residencies at the University of Colorado and Brown University in Rhode Island. He is a public medical author and has lectured internationally on cosmetic plastic surgery. Dr. Sullivan has been recognized for his work in many notable publications including the Castle Connolly Guide to “America’s Top Doctors.” He is also board-certified by both the American Board of Plastic Surgery and the American Board of Otolaryngology. Dr. Sullivan’s office is located at 235 Plain St # 502, Providence, RI 02905, and can be reached by phone at 877-435-FACE(3223). He and his experienced staff can also be contacted online via drsullivan.com or facebook.com/doctorsullivan.